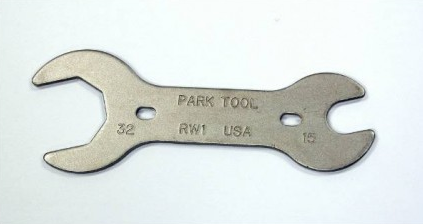 This is a review of Park Tools Road Wrench 1. It is a short 32mm/15mm to be used on a 1″ headset and pedals. Two important tools in one. Three really because I need a 15mm to adjust the tension on my Paul canti brakes. It’s nice that it’s shorter than a shop tool for weight reasons. It’s a hair over 6″. The two small holes make it able to be mounted between the frame and water bottle cage but I doubt I’ll do that. I bought this direct from Park Tool. Who, by the way, has great customer service. This entry was posted in Things and tagged Made in USA, Park Tool, Reviews, Tools on June 22, 2011 by admin.